Iran's Supreme Leader Ayatollah Ali Khamenei has warned that fuel shipments from the Gulf region could be disrupted if the US makes a "wrong move". 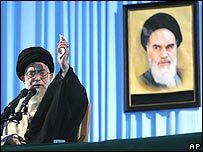 In a speech on state TV, Ayatollah Khamenei also said accusations that Iran intended to make a nuclear bomb amounted to a "sheer lie". He insisted Iran would not give up its right to produce nuclear fuel. Tehran has agreed to study proposals drawn up by six world powers to defuse the row over Iran's nuclear programme. The proposals are due to be delivered by the EU's foreign policy head, Javier Solana, within days. The precise details of the proposals are not known, but they aim to persuade Iran to give up its nuclear work - a step which Iran has repeatedly said it will not take. In his speech on Sunday, marking the 17th anniversary of the death of his predecessor Ayatollah Khomeini, Ayatollah Khamenei said suggestions Iran was pursuing a nuclear weapons programme were a lie. "We do not need a nuclear bomb. We do not have any objectives or aspirations for which we will need to use a nuclear bomb. We consider using nuclear weapons to be against Islamic rules," he said. The ayatollah launched a scathing attack on the US, which he said was the most hated country in the world. "How do you talk about human rights and opposition to terrorism when your government has prisons like Guantanamo and Abu Ghraib?" he asked. He said the US was trying to influence world public opinion with their "frenzied propaganda" but questioned whether there was indeed an international consensus against Iran's nuclear programme. Islamic countries, Non-Aligned Movement nations and other independent countries all backed Tehran, the Iranian leader said. He warned the US action on Iran could disrupt energy supplies. "If you make a wrong move regarding Iran, definitely the energy flow in this region will be seriously endangered," he said. He did not specify how the supplies would be disrupted. US Secretary of State Condoleezza Rice brushed off the warning. "I think we shouldn't place too much emphasis on a threat of this kind," she told Fox News. "I think something like 80% of Iran's budget comes from oil revenue, and so obviously it would be a very serious problem for Iran if oil were disrupted on the market." Iran's President Mahmoud Ahmadinejad has said Tehran will consider proposals from the five permanent members of the UN Security Council, plus Germany, to defuse the tensions. The proposals have not been made public but sources say they could include giving Iran a nuclear reactor and an assured supply of enriched uranium. But President Ahmadinejad repeated that Iran would never bargain away its "legitimate and legal right" to produce nuclear fuel. In Singapore, US Defence Secretary Donald Rumsfeld played down those comments, saying Iran was not in a position to respond until it had seen the proposals. Mr Rumsfeld said the US had agreed to the proposals because progress in multilateral talks had "arrived at a point where it seemed not to be moving forward".